Jean-Pierre Clamadieu joined Solvay in September 2011 as member of the Executive Committee, immediately after Solvay acquired Rhodia. Prior to that, he was Rhodia’s Chief Executive Officer since October 2003 and Chairman of the Board of Directors since March 2008. Before joining the chemical industry, he graduated from Ecole Nationale Supérieure des Mines de Paris and worked for nine-years in the French Civil Service, including as advisor to the Minister of Labor. 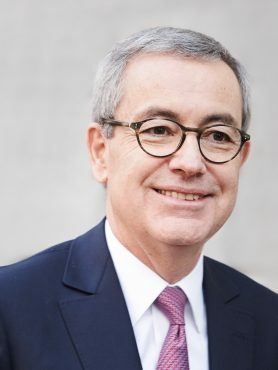 Jean-Pierre Clamadieu is a member of the Board of Directors of Axa and Airbus and Chairman of the Board of Directors of Engie since May 2018. He is also a member of the Executive Committee of the World Business Council for Sustainable Development (WBCSD). He was President of the European Chemical Industry Council (CEFIC) between 2014 and 2014 and member of the Board of Directors of the International Chemical Industry Council (ICCA). Jean-Pierre Clamadieu was Chairman of the Sustainable Development Commission of MEDEF between 2007 and 2014.